[arc episode] A dock worker is killed in an accident involving a exploding Narn freighter, leading to a strike. Meanwhile, G'Kar needs a plant from the aforementioned Narn freighter for a religious ceremony, but finds that past decision of his has complicated his life... "Oh, why does the universe hate me so?" -A Narn pilot panics while entering B5 and slams into the side of the docking tube, causing an explosion which kills everyone on the freighter and one member of the dockworker's guild. They complain about long hours, few protections, and budget cuts; Sinclair can't do anything as the budget is being redirected by Earth Alliance to military ends. -They strike; a hard-nosed Earth negotiator comes to the station and fails to browbeat them; their strike is declared illegal and the Rush Act (named for Rush Limbaugh, per JMS) is called into force, which authorizes the captain to end the strike by 'any means necessary'. This is expected to mean 'massive violence' but Sinclair instead uses the open-ended wording to move budget to appease the dockworkers' requests. -G'Kar needs a fresh G'Quan Eth for an important religious ceremony. One was due to arrive on the Narn freighter which exploded (due to pilot panic) in the docking bay. The only other person who possesses one if... Londo Mollari, who explicitly calls out the special insult of using his nephew as the 'spokesperson' of the Ragesh 3 incident as why he refuses to give G'Kar the plant. "Consider this a small, a very tiny portion of revenge for what you did to our colony on Ragesh 3. And to my nephew! Did you think that I had forgotten that?" -Londo intends to smoke the flower as a psychoactive, so G'Kar steals a statue of a Centauri god in retaliation/to prevent the destruction of the plant. Eventually Mollari cedes the plant (after being threatened that, because it can be used as a drug, it is restricted and can only be possessed for religious purposes), but deliberately waits until after the ceremony was to take place. Sinclair cheers up a despairing G'Kar by saying that the light that was used to judge the timing of the ceremony on Narn should be hitting the station soon -- and, since the rule was written before space travel, that should 'count'. G'Kar proceeds with the ceremony. - "The Narns. Echhh. They're a barbaric people. They're all pagans, worshiping their sun." -"Gentlemen, I've been up for almost two days straight with no sleep. This makes me a very cranky man." "Yess, we've noticed. Have you considered meditation?" This was the first episode that felt serialized to me, and it's when I really was sold on B5 (other than Na'Toth being herself). Remember that seemingly throw-away incident about 'Ragesh 3' in the pilot? It's baaaack. Also, Sinclair's prediction that playing games with governmental budgets and with Senatorial attaches will haunt him: probably justified! 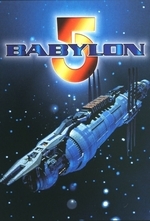 This does feel like the moment where the series starts to hit its stride, and starts building off that which prior episodes had spent time establishing -- not only the Ragesh 3 incident, but also with Sinclair's characterization as a creative problem-solver and Babylon 5 itself as place in tension as both a neutral meeting ground for people of all governments and also an Earth Alliance military station. The continued blending of personal and geopolitical and religious problems is also -- not a facet of serialization, exactly, but the ways in which the show often intertwines all three is certainly on display here; G'Kar's problem is with Londo-as-a-person, but also because of their respective governments' history, and also immediately precipitated by Earth Alliance budget issues -- and mediated by Sinclair in his simultaneous capacity as mutual acquaintance who understands their real issues, as a diplomat representing Earth, and as the station's commander with the police powers that attach thereto. With G'Kar, those interests all align for Sinclair; the central tension of the dockworker's strike (for the main cast, anyway) is that those interests are at odds with each other because the Earth Alliance itself is at odds with itself -- that Sinclair has to choose between different views of what the Earth Alliance should be and what it should do. Personally, I love Sinclair's resolution to the problem in that it positions the show as acknowledging the dockworker's valid complaints, and for how it strikes a position on labor disputes: that they can be valid and that people can be underpaid. That's not a message that comes up often (ever?) on Star Trek (Babylon 5's contemporary), and I remember this episode, originally, as helping the show carve out a space for its own identity: realism not only in caring about the science of science fiction (rotation for gravity! hydroponics for food!) but also in caring about the economics of science fiction (coffee is expensive! moving goods costs money! the station has a budget!). It's never more than a an undercurrent to the show, but it's an appreciated one. I am here for unions in space! The only comparable episode of Star Trek is Bar Association, where the staff at Quark's bar unionizes. Of the two, I slightly prefer that episode, because of the good character development for Rom. (Despite all the things By Any Means does right, there isn't much growth for the regulars.) But in terms of making a statement about labour disputes, the setting undercuts the episode. In Trek, unions are inherently marginalized because the federation is a post-money, post-scarcity society. Only aliens need unions; humans are beyond that. B5 shows us a situation where labour disputes affect everyone. Economics on B5 are something of a mixed blessing. It adds a lot of verisimilitude to the world, and sets it apart from Trek. But it does so by taking then-contemporary western culture and plopping it into the future without much change. People read paperbacks, get their news from TV, struggle with mental health and addiction, and cope with austerity budgets. So it's realistic in the sense that B5 addresses economic issues that Trek just handwaves over. But unrealistic in the sense that the economy of the mid-90s is no more everlasting than the media habits of the mid-90s. Basically, B5 isn't that interested in doing futurism, in imagining how society will change in the future. In theory, that ought to be a drawback for an SF show. But it also gives us episodes like this one, humans who pray and sit shiva, and so many other things that give B5 a voice all its own. Oh, and one other thought: I was surprised that Garibaldi and his force aren't in a union. They've always seemed like a civilian police force — an RCMP detachment in space — as opposed to Earthforce members. But maybe they're supposed to be noncoms in Earthforce?